(August 25/15) The now systematic burning of scientific libraries by Ottawa over the past three years can no longer be seen as just near-sighted policy. It has to be recognized for what it is: the active sabotage of our publically financed research and development capacity by people who do not value or understand knowledge in the public interest. Friday’s announcement that the library at the Lethbridge Agricultural Research Station had been trashed was especially tragic and the excuse proffered by a Conservative stooge that requests for library materials had declined is especially obnoxious given the wholesale firing of scientific personal over the past ten years by Ottawa. 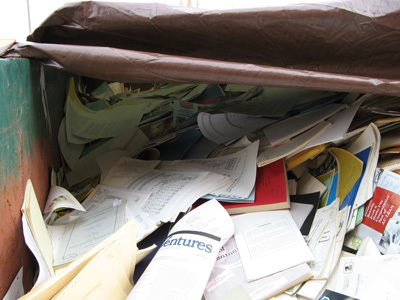 The dumpsters outside the library filled with scientific monographs, books, and other publications also give the lie to the contention that the materials have been copied onto computers for future use. Science is built in increments based on previous studies. Those studies, described as “gray matter” by research librarians because the studies are usually monographs bound in gray covers, and no matter how old, often contain nuggets of information critical to current problems. Scientific researchers, the people who actually “get dirty with their data,” have to spend years learning about their subject by going into those libraries and actually reading the papers left for future generations by their predecessors. Those dusty papers are not usually available either as digital versions or in textbooks but they almost always contain critical background which allows people today to understand the context of their work. Consider some short examples: In 1927 a researcher published a paper observing that wild bees were especially prevalent in alfalfa crops that produced heavy seed yields. Contemporary researchers concerned with declining bee populations may have been interested in this research and the subsequent papers that grew from it. Unfortunately these gray matter papers, referenced in an obscure 1963 report from the Entomological Society of Alberta, have almost certainly been trashed by Ottawa. In 1929 a solid stem wheat was tested for saw fly resistance resulting in the first saw fly resistant wheat “Rescue” being licensed in 1946. This new wheat saved Canadian farmers from having to buy the newest expensive wonder chemical DDT. Today, farmers still grow midge resistant wheat based on this early work. This insect resistant wheat can be seen as a fine example of science in the public interest that was free of the conflicts-of-interest built into private funding of agricultural research. Would one of the giant foreign-owned agro-chemical-seed companies actually develop a wheat strain which did not need the application of one of their very profitable insecticides? Students of history know that nothing happens without a context. The same applies to political movements. There is a strain in Conservativism which recognizes the importance of preserving (conserving!) the work of previous generations. However there is also a strain in that political philosophy which has a tradition of burning books which goes back to the Middle Ages. It is now painfully obvious to all but the gullible or dishonest that the book burners are now in control in Ottawa and they have just reached out again to trash another western Canadian asset.